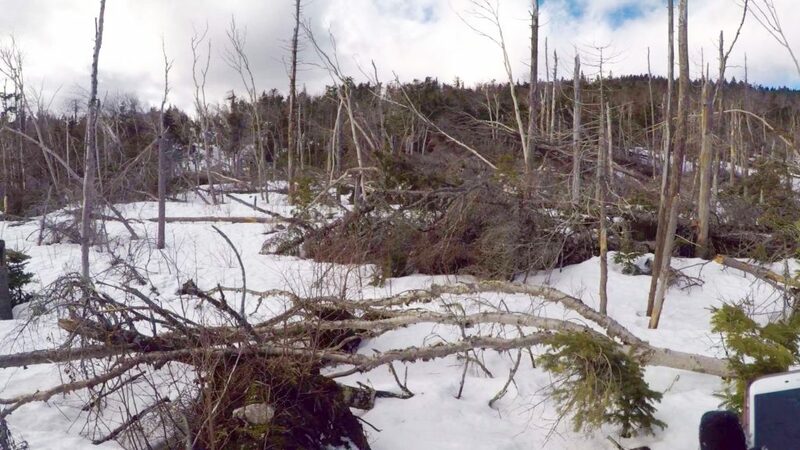 Most of the rescues in the White Mountain National Forest are done by the victims and the party they are with — self rescues. Others are aided by passersby. More still, never need “rescue” because they just manage to avoid it. They have a close call or scary encounter, a near miss, and that’s it. They live, learn, and move on. Meet Shalla. Shalla is a hiker who, thanks to a series of small decisions, found herself having a close call, a scary encounter for herself. She got through it by not losing her head, with some luck, and by being brave. Braver still, is her willingness to share her story with others on social media, so that they may avoid the mistakes she made. With Shalla’s permission, here is her story, in her words. In the summer a clear trail winds through this pretty area. In the winter it can vanish. 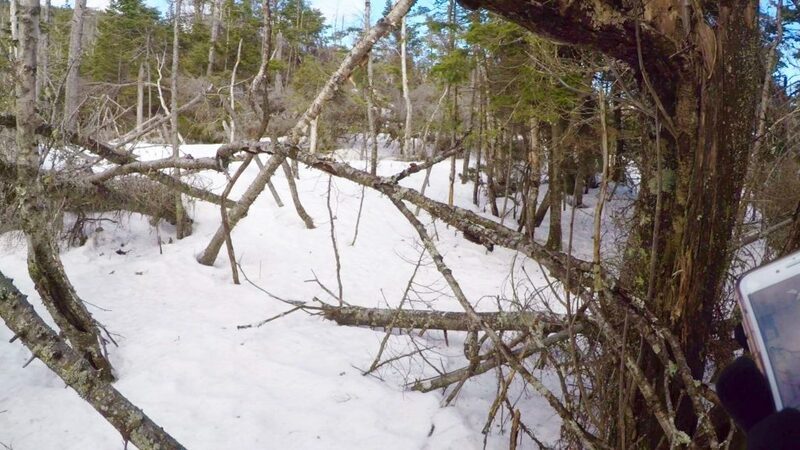 Off trail the area is a tangled maze of blowdowns — remnants from Hurricane Irene in 2011. A person could become entrapped here, swallowed by the trees. A friend and I set out to climb Whiteface. It was a beautiful 50-degree day. The sun was shining. It was perfect! We headed out on the Blueberry Ledge Trail. We met up with a solo hiker and his dog and were chatting about the mountains and the single season winter 48 patch. I will admit that I was very jealous that he was finishing his today. 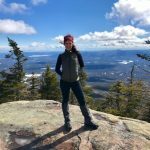 I just started the 48s in late January as a new hiker and I have been doing so well that I started doing the math last week to see if it was possible for me to finish them before the winter officially ended on March 21st (the answer was no!). I had looked at combining long hikes to see if I could have possibly made it happen but again it didnt look possible. I had set a new goal of finishing the halfway mark and the Presidentials before winter’s end and I had thought I made my peace with it. So when this hiker mentioned he hadn’t taken Blueberry Ledge [Trail] before, he had only done it from the Tripyramids and the Sleepers a long time ago my gears started turning. We split with this hiker as my friend couldn’t keep pace and I wanted her to have a great day. About halfway up I said something about if we were real crazy we would have hiked over to the Tripyramids to her. She said, well you should do it and I will drive and get you. I giggled… thought about it and said awesome. 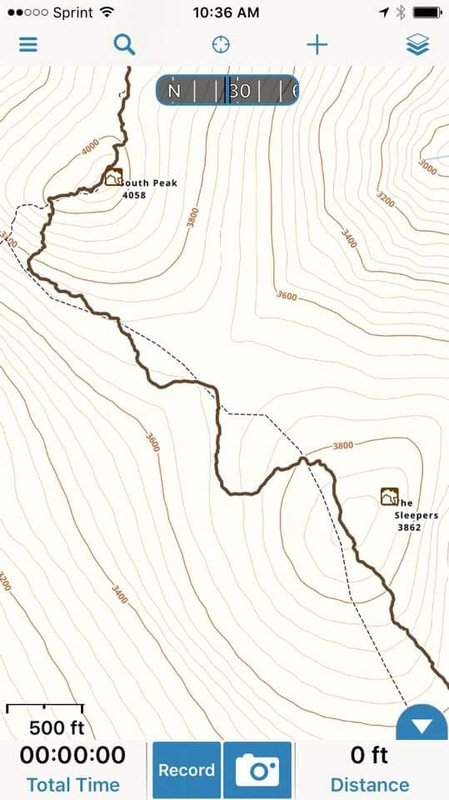 I called a hiking friend while I still had service to ask him to track the route and tell me if he saw any water crossings (I detest water crossings), and how long it would be. He said the trail would be 9 miles from Whiteface to the road on the other side of the Tripyramids. He said it all looked good, told me I was crazy, but that I could do it. So with his vote of confidence I decided I would go on an adventure. Whiteface was ledgy, but due to some melting we were able to navigate up in just spikes. After a quick lunch we split ways. 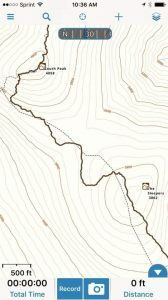 My friend headed back down Whiteface with the plan to grab the car and drive the Kancamagus [Highway] to pick me up at the Pine Bend Brook trailhead. Did the use of a cell phone app encourage getting deeper into trouble, or did it save Shalla’s life? Maybe both? I started to the Sleepers and the trail was well blazed for a bit. When I took the turn to head on the Sleeper trail the trail’s blazes disappeared and the trees were dense. There were some trees down. I was able to navigate easily though until I hit the summit area of East Sleeper. What I now know as a tall canopy of trees. Currently [there] was hundreds if not thousands of trees down. The trail was completely obliterated. I also now know that there was about 6+ feet of snow in this region so even if a marked tree was not down, the markings were under the snow. I also now know that this is one of the last true [Sandwich Range] Wilderness sections in New Hampshire. 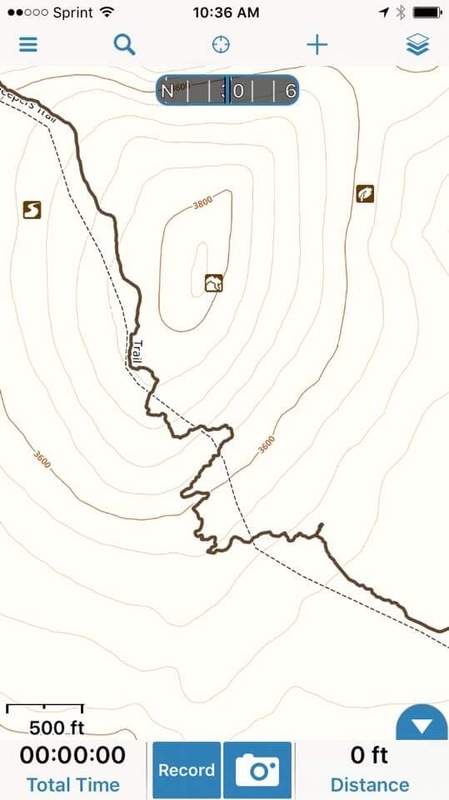 The dashed line is the trail. I got very worried at this point as I couldn’t find the trail, and I fell into spruce trap after spruce trap. Luckily not more than upper thigh deep. It required climbing over trees, crawling on my hands and knees at some points… it was overwhelming. But I had gone too far to turn back and make it in time to meet my friend who would drive towards the “Kanc” and I didnt have [cell] service to let her know. I tried sending texts to my hiking friend who was at work and nothing was getting through. I used my Gaia app to help me try to stay on the trail which just led to me zig zagging through the downed trees. I finally decided to just try to get to the top and assess there. I know I am very lucky that I wasn’t falling through deeper. My energy was zapped from just the amount I was falling through. Once I got to that point, there was still no trail, but I was close enough to the trail on my Gaia map that I continued on. At this point I was worried because the trail had me going diagonal on the side of the mountain according to my phone and the trees were so thick that I was climbing, pulling, crawling, just to get through. I knew that the trail would intersect with another so I just kept going. Exhaustion was taking its toll as I didnt factor into my plan all of the postholing I would do with snowshoes, the climbing of the trees, and the wet heavy sinking snow. I came out to a slide [Mt Tripyramid Trail’s “South Slide”] that was definitely the steepest climb I have done yet. I switched to spikes and climbed on my hands and knees up. This was the point when I was worried about needing a rescue. I wasn’t even halfway though my trip and my body had taken a toll. I was bruised, scratched and exhausted… and I definitely was being taken over by fear. I almost cried but held it in. I wouldn’t let myself be defeated, yet. A mine field of difficulty as far as the eye can see. I kept climbing and when I reached trees again, there was no trail still. I was devastated. But I knew that I was close enough to South Tripyramid that I just had to keep going. I remember singing in my head, Just put one foot in front of the other… yes, I was going mad! Finally I reached what looked like a trail; here and there I would find a post hole. Never had I been so happy to see postholes! I made it to the South Tripyramid and tried to text again but no service. My game plan for a rescue if needed was I just kept peeing on every mountain so that the dogs would know I had been there. Crazy? Yes… but I had switched my brain to survival. I started off towards Middle Tripyramid and again no trail. I was lost in a section where there were only big boulders that I couldn’t scale, so I just kept circling around them to try to find a way up and then I found the trail! No markers, but again some postholes. On Middle, I was able to rev myself up to keep going. I was now halfway. I couldn’t bear to look at the whole map so I kept zooming in and set small goals for myself. I would only worry about making it to the next mountain. I headed down off of Middle [Tripyamid] and again, no trail markers. I could once in a while see faint snowshoe tracks but I would lose them and wander off what my phone said was the trail. But I could see the next peak in the distance so I just headed that way. My worry was that I was down to 20% battery for my phone and I wasn’t sure if I had packed my battery backup. I didnt want to know yet, so my plan was to look for it when it actually died. The good news was that as long as I stayed in airplane mode my battery wasn’t going down and the app was working. Later that night I discovered I did have the battery pack and a wind up battery charger… phew! I did eventually pick the trail back up and I made it to North [Tripyamid]. Here I knew I could do it. I talked myself into staying calm and that descending was going to be easy. 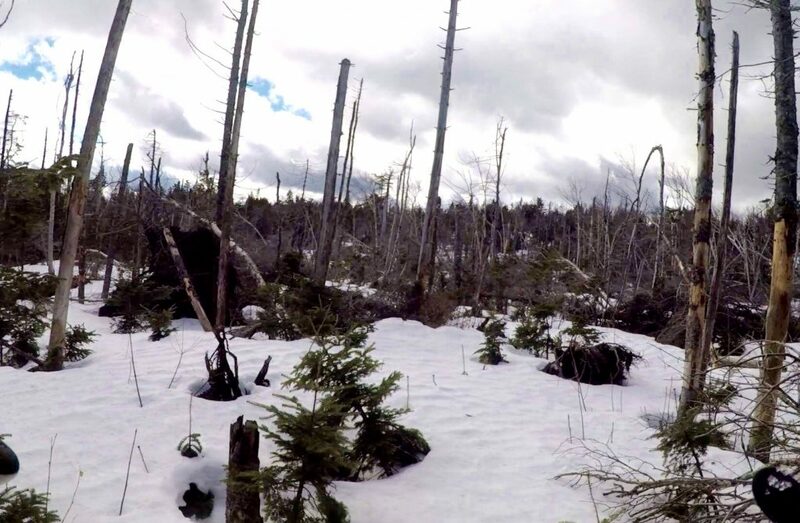 I had a great view of Mt Washington which always gives me happiness and I headed down what was an extremely deep “trail.” Again [there were] no markers up high but I could see tracks and postholes. 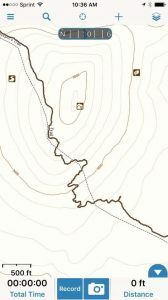 I continued to use my phone to stay on the trail when I couldn’t find tracks and as I got to around 2000-feet in elevation I did start seeing trail markers. This is also when the river crossings began. I hate river crossings. I had to cross at least 20 times — I lost count. When it started to flatten out I was shocked to see how far I still had to go. When I had about two miles left to go the wind started howling, the sky darkened, and it started sprinkling (my friend later told me on the road it was a downpour and dark… I was very lucky). I ran as often as I could, but I was just so tired. When I was about one quarter-of-a-mile from the road I could hear the cars. I just started balling. I have never cried so hard in my life. I reached the side of the road and my friend’s car was there. All I could do was sit down in the snow and cry hard. She took my gear off of me and I just sat there and cried for a few minutes. I knew I had been scared but I guess I didn’t realize just how scared I was. But I made it, and learned a valuable lesson: never change the plan while on a mountain, and always research your plan before heading out. And one more scary piece to add to the story: when I unpacked my bag the next day, I had only 1 ounce of water left in my bladder! Some may wonder about what was my backup plan. What if the worst case scenario happened? On the road was my friend waiting for me, she had no service but her plan was at 5:30 PM she was going to go to the ranger station that was down the road. She had a piece of paper ready to put on the sign to tell me to stay there. My friend we had telephoned earlier in the day was waiting until 5:30 PM to call the ranger as well. 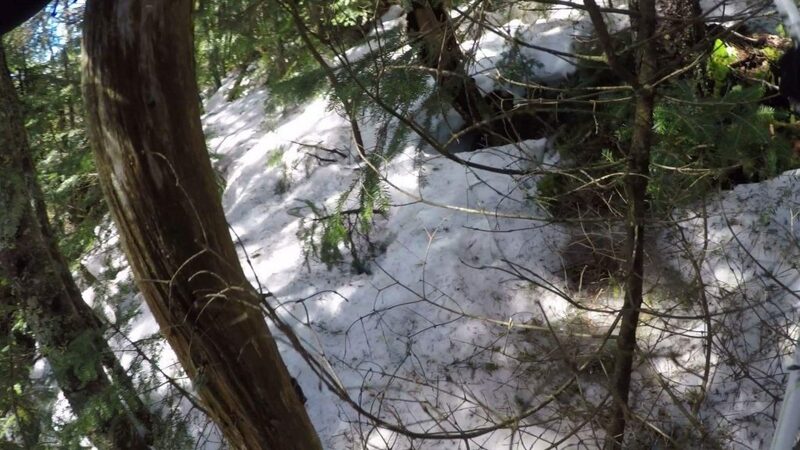 I did have backup jackets, an extra set of base layers, extra gloves and hats, an emergency bivy, extra food and I could have eaten snow to make it. I had found several large boulders along the way that had space under them that I had marked in my head to go back to if I needed to find shelter. I also had two headlamps and had gotten them out when it had gotten dark. If I dwell on what would have been the worst to happen, it would have included falling deep into a spruce trap on the sleepers and not been able to get out. Had the snow been a little softer I can see that I would have had more problems. Fortunately I did survive, but I do realize that I made major mistakes and will learn from them. Thank you for sharing, Shalla. Others will learn from your mistakes, too. The original piece can be found here on Shalla’s blog.